The first assembly of a mosasasurus for the southern hemisphere and the reassembly of a giant sloth were presented on July 2nd as part of the celebrations of the 202 anniversary of the “Bernardino Rivadavia” Argentine Museum of Natural Sciences (MACN). The skeletons belonged to the paleontological collection of the institution. The mosasasurus (Taniwhasaurus antarcticus), lived at the end of the Mesozoic Era, 70 millions of years ago, and it was 6 metres high. This carnivore had flippers to swim, what differentiated it from its current relative of terrestrial habits, the Komodo dragon. Furthermore, its flat tail helped it to propel itself underwater. It was a dangerous predator of the warm seas that surrounded the Antarctic at that time. “The remains of this mosasasurus were found in the year 2000 by a joint expedition with the Argentine Antarctic Institute in the James Ross Island in the northwest of the Antarctic Peninsula”, Fernando Novas, CONICET principal researcher at the Museum and director of the project for the reconstruction of this specimen, explains. For its part, the giant sloth (Megatherium americanum) lived in South America since the middle of the Pleistocene around 600,000 years ago until 10,000 years earlier. “This species spread widely through the current Argentine territory. It was a herbivorous mamal with a relatively small head in relation to its body size. In spite of its weight, between 4 and 5 tons, it could stand on its hind legs”, Juan Carlos Fernicola, MACN paleontologist, states. For Fernicola, the first remains of this species were found at the end of XVIII century in río Luján, in the province of Buenos Aires, and then transferred to the Real Museo de Ciencias Naturales de Madrid, Spain. This specimen belongs to the MACN and was discovered on the banks of the Salado river. Currently, it has been assembled in the building of the museum since 1937. 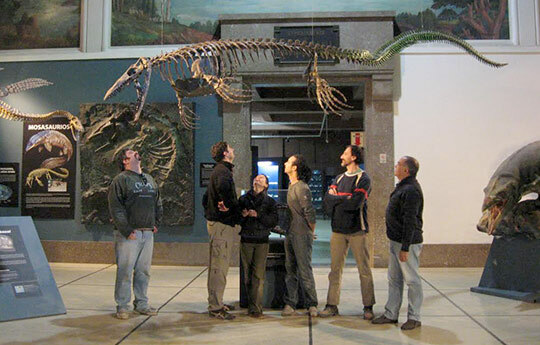 Likewise, the mosasaurio’s reassembly project involved the participation of: Marcelo Isasi, CONICET associate professional at the MACN; Marcela Milani; Ricardo Stoll; Carlos Alsina, also from the Museum; Gabriel Lío, artist; Matías Motta, Gonzalo Muñoz, Sebastián Rozadilla and Mauro Aranciaga, all Paleontology students. The assembly of the giant sloth was in charge of Maximiliano Iberlucea, Marcelo Miñana, Luciana Ferrazi and Ignacio Legari, all MACN staff.